I call this Pond #2, but it's really the same pond. The thing is more like a small lake. Overcast when I painted this one. Sprinkled on me a couple of times. Let me know what you think. I finally asked a local farmer if I could paint on his land. He said yes. Here is the first painting of the pond. There's a hundred great paintings on that farm. This is the largest plein air painting I've done. It measures 18" x 24" and is oil on canvas, mounted to birch, painted with a palette knife. I gessoed a few times, sanding between each coat. Then applied a wash of red and yellow ochre with turps, letting it dry before applying paint. Not only was the size a challenge for me, but the wind kicked up a lot towards the end of the session, forcing me to hold onto the panel with both hands. I meant to take a lot of in-progress pics, but you know how that goes, I forgot after the first one. Did this one early Saturday morning. I've included a pic of my set-up and location. I've also included a pic of my bloody finger. ewww! Sorry about that. I was just laying in my sky when I went to wipe the palette knife off on a paper towel I was holding in my left hand. Well...I missed. I gripped with the finger and thumb and pulled the knife across the bend in my index finger. Looks a lot worse than it actually is. You can see the painting might have suffered from the accident also. :) Total of about 45 minutes painting time on this one. Notice how I changed the blacktop road to dirt to keep the organic feel, and dropped the drive altogether. Did this plein air painting down in Cedar Creek, looking toward a small spring that usually has no water in it. Thought I should try to paint it before it dries up for the summer. Google approves using Street View as reference! As many of you know I've been using Google Street View as a resource for paintings for some time now. Every so often before the recent State Series. But painting 50 works of art in just over two months gave me a real appreciation for Street View, and the possibilities that lay within it and art combined as a vehicle for painting the world. After speaking with Google's Maps Team, it has been determined that artists can use images from Google Street View as reference for creating paintings and drawings, and the artists can sell these works. One thing that needs to be made clear. If the artist shows an original view on which a painting is based, the artist must make sure to keep the Google logo and copyright visible on the reference. The piece of art needs nothing of the sort, of course. While this news is wonderful, I have a feeling I'll be letting you know about other very exciting things in the near future. One I'm hoping will emerge is the use of Street View by disabled artists and those confined to their homes/facilities, or mobility challenged. This is my first still life with a bunch of small limbs in front of me. Pretty daunting to say the least. Here are three I did today. The two plein air pieces, "Up the Creek" and "Lawson's Bottom" were done this morning and this evening respectively. The portrait, "Next", was done from a reference photograph, and was attempted to see if I could do a portrait with the palette knife. I actually started it last night and finished it today. Don't know if it was successful, but it was fun. Did this plein air this afternoon in just over an hour. Abstracted some of the nonessential parts. Tried to keep the focus on the water. This creek is mainly flat limestone, with the walls of the creek very steep in rock also. Tans and grays dominate. The only red was the dark red underpainting, then I used cobalt blue, cad yellow medium, burnt umber, yellow ochre and white. This is the start of what I hope to be an extensive series of the churches in Cumberland County, Kentucky. This is 9" x 12", oil on mounted canvas, painted with a palette knife. I knew when I went out this afternoon that time was going to be short yet again (this was about an hour). The clouds were rolling in, the wind picking up, and the temperature dropping. While painting it had dropped through the lower 50's into the upper 40's. But cold hands and feet were nothing compared to the pre-painting party I had. When searching out a spot on this particular piece of land (of which I have permission to roam freely), I decided to go into the pasture where the cattle feed most of the time. It looked deep in mud, but there might be a dry spot to paint another old house. Instead of going through the gate I looked at the barbed wire fence and saw it was nailed to the tree which meant no electricity. Well, somebody check my glasses for me please...I had lifted the strand above me with my right hand and was straddling the lower strand, when I pushed down on that one with my left hand... ZAP! I hit the ground hard on my right knee, while feeling like something just bit the fire out of my left arm. Too bad nobody was there to take a pic, I'll bet it was pretty funny to see. By the way, that fence is hot. So be careful. This plein air piece is 9" x 12" on mounted canvas, palette knife. I had a small window of rainless opportunity just after a soccer orientation meeting this evening to try and get some outdoor painting accomplished. This one was about 45 minutes with only the soles of my shoes getting wet. So, a quick one with the knife. If anyone had seen me while painting they would have thought me a mad man. 8" x 10", oil on mounted canvas, palette knife, comments always welcome. This particular machine is going to be hammering out a huge ditch across the only drive of my wife's business tomorrow. Lots of road construction going on, and I hope to get out and paint more of it. This is my first large machinery from life. It was kinda fun. Did this plein air piece this afternoon. You can see how I changed the scene once again. Trying to manipulate the composition into something I liked better than what was in front of me. 8" x 10", oil, canvas mounted on birch, palette knife. Oh, what a long strange trip it's been. Actually, not that long. I started this series on February 7, 2009. Just over 2 months to do fifty small paintings. Mostly knife work. All are 5" x 7" in oils, on canvas panel. All but two are landscape format. Don't know why I did two vertical, I guess just to mess the display up. I did this series to show what might be accomplished by using the technology that is available to us today. By using Google's Streetview technology I have traveled to 49 states and Washington, DC. Hawaii hasn't been posted yet. When it is I'll do it and update the series by that one, taking DC out. I'm hoping some good may come out of this series, that Google will allow, i.e. give permission, to artists working in traditional methods (no digitally altered art) to use Streetview as source for reference material. This would open up an entire world for artists that are disabled and confined to their homes or facilities, or with restricted mobility. At this point I have contacted Google concerning the use of Streetview. When a decision has been reached, and they let me know, I'll then let everyone else know. 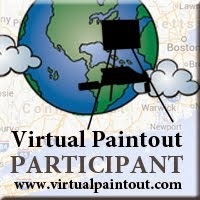 Please feel free to join in on the Virtual Paintout, April is Amsterdam. Paint away, but until Google has decided whether to allow artists to use Streetview as a reference, I'd hold off on selling any of the works. Of course, that is only my humble opinion. As for now this is the last (until Hawaii) of the series. 5" x 7", oil, canvas panel, palette knife. I left my home state until the end. Sort of anticlimactic don't you think? As a side note...Google did give permission for artists to use Street View as a reference, and artists can sell their work without fear of copyright infringement. See sidebar here, and on the Virtual Paintout blog for more info. Did this plein air this afternoon. Been down in my back for a couple of days, but it feels much better after painting. Here's #49 in my series. Doesn't seem fair now, does it? Anyway. I've got two more states to go (not counting Hawaii, which I will do after it's available). Seriously though, I've recently been given the honor of receiving the same award THREE TIMES! And I would also like to seriously thank the people that gave me the awards. I believe one thing I need to do as a recipient is to list 7 things I love. And then list seven other artists to whom the award shall pass. Here's a plein air I did this afternoon. The light kept changing, so it became quite a challenge. Need to simplify, simplify, simplify! I did lose a bunch of the buildings and rearrange things a bit. 9" x 12", painted over an old painting on linen panel, brushes. The usual limited palette. Mark it off the list! This is state #45 in my quest to capture a scene from all 50 using Street View. This is a departure of sorts for this series, as I used brushes and a slightly different palette. I did this little experiment today. Went to Dale Hollow Lake State Resort Park and set up my gear next to the road. Both paintings are of the same scene, both are 5" x 7" on red toned canvas panels. Both took about 45 minutes. Not looking for a finished piece, but instead a good reference for another painting. I painted the knife one first hoping to loosen my brush later on. Don't really know if it worked or not, but it was fun to see the differences in each. Both pics have a bit of glare on them. I'll try to get better pics later. I did these three while we were on a short vacation to the Smoky Mountains this week. The girls were swimming at a huge indoor waterpark with 1000 other kids, mostly screaming. :) So I took a few breaks and tried to paint some of the natural beauty of the area. The top one was at the river between Pigeon Forge and Gatlinburg. Talked to quite a few tourists that kept sneaking up behind me. This one I painted with brushes. The middle one was next, painted with a palette knife. It was on the same river but back into Pigeon Forge next to the Old Mill. The last one was done next to our hotel. Looking back toward town. Again with a palette knife. These are the first plein air paintings I've tried with the knife. I liked it. Really made me simplify. Comments are always welcome.